1 Clean Wash bottle, teats, breastfeeding equipment in warm soapy water, then rinse in cold water. Fill your unit with 5L of water, add 1 Milton tablet. Close the lid and in just 15 minutes everything is ready to use. No need to rinse. Items can stay in the solution until needed. Renew the solution every 24 hours. Did you know? Items can be added or removed from the same solution throughout the day, as it only needs changing every 24 hours. Simply add a bottle to the solution and after 15 minutes it is sterilised and ready to use again with no need to rinse. 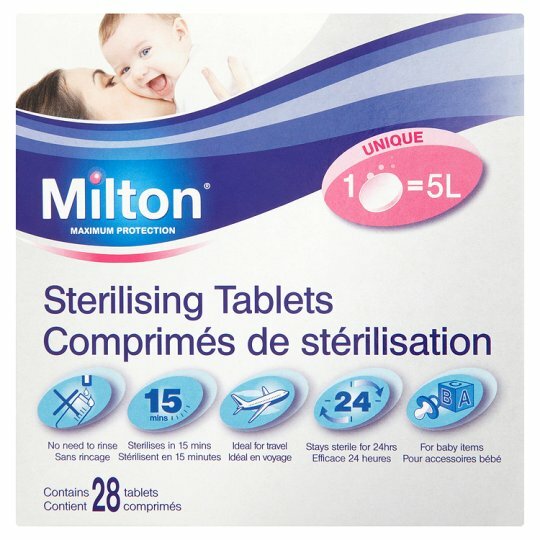 What should I sterilise? Bottles, teats, soothers, plastic feeding spoons, weaning bowls, teething rings, toys, breastfeeding accessories such as breastpump parts and milk storage containers. Why sterilise? During your baby's first 12 months, their immune system is still developing so they need extra protection from germs. Warning: Harmful if swallowed. When in contact with an acid, releases a toxic gas. Irritant for the eyes and respiratory system. Toxic to aquatic life. Keep away from children. Keep the pack closed away from dampness. Keep away from food and drinks including animal food. When in contact with the eye, rinse well and contact a specialist. If swallowed contact a doctor and show the packaging. Do not empty in the drains. Do not throw away in the environment. TAKE CARE NOT TO SPLASH THE SOLUTION AS IT MAY DISCOLOUR FABRIC.